In Australia we generally like to eat salads and ice cream when the weather is warm. But in some countries, they eat hot when it’s hot, and they are right! A rigorous experiment revealed that on a hot, dry day, drinking a hot beverage can help your body stay cool. So next summer, do us a favour and try it. 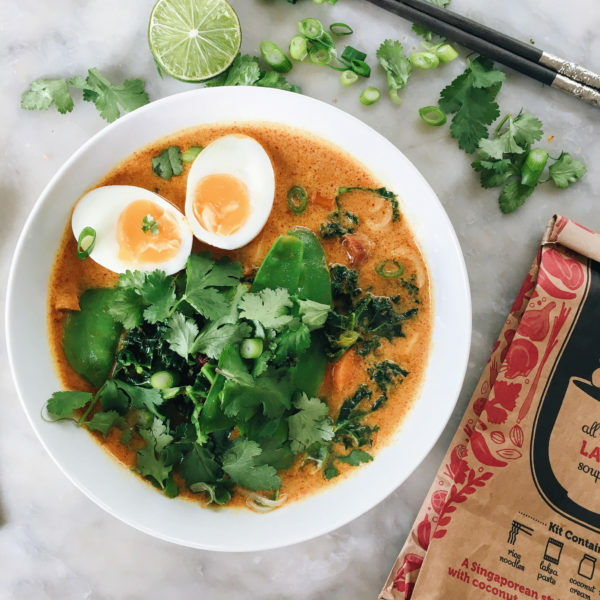 Try our Hart & Soul Laksa Soup Kit in the midst of summer to not only cool you down but fill you with the right nutrients. Laksa is a soup that embraces the aromas and heat of spices. Did you know that chili makes see everything through rose-colored glasses? It secretes endorphins in our brain. and the more you eat, the more you feel good! Once again, Holly from @thehealthyhunter has done it, her beautiful recipe combines vibrant flavours of the soup and the benefits of the veggies she adds to it. So you can enjoy a gorgeous and truly healthy meal anytime of the day or season in just 10 minutes! Bring a small pot of water to the boil and place eggs in. Cover and cook for 6 – 7 minutes. Once cooked remove with a slotted spoon and keep boiling water. Run eggs under cold water until cool enough to handle and then peel. Meanwhile follow step 1 (bring 250 mml of water to boil and steep herbs and spices for 2-3 minutes) of packet directions. At step 2 add a handful of snow peas, 1 cup roughly chopped kale, 1/2 cup finely sliced carrot and 1 Tbs finely shopped spring onion. Cook for 2 mins. While this is cooking place noodles in your pot of boiling water and remove from the heat. Let sit 3 mins (while you’re finishing the soup. Follow the next step on the packet and add paste and coconut cream to the vegetables. Stir to combine and bring to the boil. Place noodles in the bottom of a bowl, add laksa, slice egg in half and add to the bowl. Top with coriander and spring onion. Squeeze over lime just before slurping.